We are a leading egg ingredient producer in the United States, with global distribution. We supply egg ingredients to food manufacturers, brand owners, foodservice industries and pet care manufacturers. We practice sustainable agricultural production, managing the entire process from grain to finished product, to efficiently produce a wide range of fresh, high quality egg products and ingredients that feed the world. Our business is supported by ag 100%. Rembrandt produces egg products by humanely caring and feeding 16 million laying hens that produce millions of eggs each day. The eggs are then harvested, thoroughly cleaned, inspected and processed into a wide range of pasteurized egg products for sale and distribution to both domestic and global markets. My business is ag because we have a strong results-oriented focus and our finance teams support our operations team with metrics and KPIs to measure our performance to both our standards and industry data, where available. 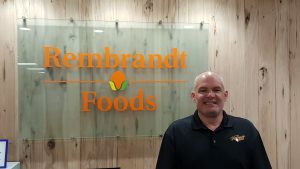 Rembrandt recently announced plans to build a fully dedicated cage-free egg production site in Lake Preston, South Dakota. The facility expansion will initially house approximately three million cage-free layers, in planned phases. The facility will have on-site breaking equipment, with further growth planned.